You’re probably slightly interested in beer to be on this website. If it’s just for the girls, it’s time to see somebody there is much better “content” on other website and they are free too! So the new Show on the Discovery Channel is on called “Brew Masters.” a slightly deceptive title since it’s about one brewery, but we’re not complaining. 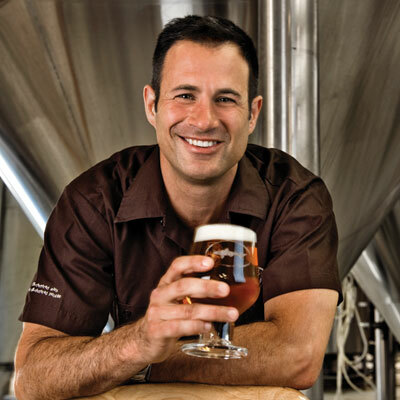 Sam Calagione is founder of the cult brewery Dog Fish Head. They have been brewing interesting beers since they started and made a name for themselves this way. Sam is one of the few personalities in the business than can keep you watching, and the show revolves around his quest to brew beer from around the world using sometimes odd techniques. Spit as an enzyme for beer? Yeah that’s right. It’s all in there and we’re 2 episodes in and we feel we an give an accurate review of the show and what we like and don’t like. This episode was about Sam coming up with a beer to pair with the release of the Sony Miles Davis CD. Our take– For the first show we were a bit disappointed. We felt there was no explanation about who Sam really was and brewing a beer for the mega corporate Sony seemed a little odd to the “local craft” theme. But we’ll take a little selling out to get craft beer in places its’ never been seen and the Sony connection might make people put down their iPads and stop texting. We also found the “humor” to be a little forced and odd at times. This episode follows same to South America where looks for traditional brewing methods of Chicha a fermented corn using human saliva as an enzyme to start the fermentation. Our Take– There still some C- comedy going on but at least this episode went where we thought the series would go. They follow same to South American as he researches ancient traditions and visits Chicha-pubs! We get a glimpse of how it’s really brewed and how they were going to follow that way back in the USA to make it more authentic. We think they should have explained that maybe you can’t catch anything strange from the “spit donors” more in the episode, but overall this was a big improvement over the first episode that made us start to wonder if it was going to be an ad for bigger companies the entire time. This episode follows DFH as they do a collaboration brew with EPIC brewing in New Zealand brewing with a local tree tomato. The also show the construction at the brewery interfering with their Punkin seasonal. Our Take–It’s taken 3 episodes but I think this is where the series should have started, showing the beers that have odd ingredients and some of the comments and challenges behind it. Maybe now we’ve gotten behind it a little we can say they do a decent job keeping the science part simple and the personality of Sam and crew is starting to shine through. I’m sure he got more comfortable over time with the camera being there. One question we have is that the focus on the camera seems to be a little off and odd? Anybody else notice that? It was interesting to see part of the judging where they discussed they couldn’t detect any of the flavors. Also when you smoke something does that mean burn it on the grill? The smoking of the PORTAMARILLO seemed to just burn them, which to us would give a burnt flavor and not so much smoke. We like that the beer didn’t win anything so we don’t think that every beer is a gold medal just because it’s strange. Still it was a good show we are looking forward to the next episode. We will update our thought on each episode as they air and if you want to join in the discuss log in to this website or go to www.facebook.com/beermag to chat there.